Hot and damp weather with no wind is not really my favorite thing in Berlin. And as there`s no sea or big lake near, the whole city just seems to be inside a pot, boiling. On top of that, had to work inside the whole day; a cold Riesling was in place. 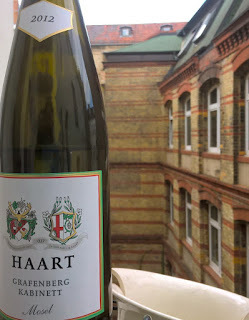 So picked one up from a local wine shop, just a few blocks from my appartement, Weinladen Schmidt Prenzlauer Berg (if you`re in Berlin and in need of a good Riesling, check it out). Feels like this is in a good place right now. Quite intense nose: ripe pear, baked apples, hint of petrol, some saltyness (sea breeze feel). Supple and also nicely dense palate with electric, but gentle acidity. Tropical fruits, with drops of lemon/lime. Honeyed and somewhat salty and grainy finish. Good length. Elegant, refreshing, yet not too simple Kabinett.